180001, Jammu & kashmir, India. The beautiful valley of Kashmir harbors a diversity of medicinal plants that have been used in traditional health care systems for thousands of years. This knowledge, transmitted by oral tradition from generation to generation, has been eroding in recent decades due to rapid cultural change. Besides this, medicinal plants are being overexploited at an alarming rate. Untill now, the traditional uses of medicinal plants in Kashmir have not been reviewed and if reviewed, focus has been either on particular groups or on restricted regions. Here, we present a review of traditional uses of medicinal plants by the People of Kashmir valley in order to provide comprehensive documentation, diseases treated in traditional medicine and suggest perspectives for conservation and management of medicinal plants of Kashmir. Medicinal plants have been used for centuries in traditional health care systems and numerous cultures around the world still rely on plants for their primary health care. With the recent advancements in plant sciences, there has been a tremendous increase in the use of plant based health products in developing as well as developed countries. About 70-80% people around the globe rely on medicinal plants for primary health care [1,2]. Medicinal plants also form a source of income for millions of people. According to World Health Organisation (WHO), ethnomedicine has retained its reputation in all regions of the developing world and its use is rapidly growing in the industrialised countries. Traditional herbal remedies account for 30-50% of the total medicinal consumption in China. In Ghana, Nigeria and Zambia, the first line treatment for 60% of the children with malaria is the use of herbal medicine . With minimum side effects and low cost, people in developing countries like Bangladesh (90%), Myanmar (85 %), India (80%), Nepal (75%), Sri Lanka (65%) and Indonesia (60%) have strong belief in this system of medicine . As estimated by the World Health Organization (WHO), the present demand for ethanomedicinal plants is approximately US $ 14 billion per year . The demand for medicinal plant based raw materials is growing at the rate of 15 to 25% annually and is likely to increase more than US $ 5 trillion in 2050. In India the medicinal plant related trade is estimated to be approximately US $ 1billion per year [6,7]. World Health Organization has made an attempt to identify all medicinal plants used globally and listed more than 20,000 species . Owing to the topographical variations, Kashmir Himalaya harbors a rich diversity of medicinal plants. Since times immemorial, people in the region have learned and practiced medicinal usage of plants. Through ages, this ancient prized wisdom has been transmitted from generation to generation as part of oral traditions . With Concerns regarding the loss of native knowledge and the possible extinction of medicinal plant resources of Kashmir, there is urgent need to document and review the studies carried on the medicinal plants of Kashmir. Only a few studies have been carried out to review traditional use of medicinal plants of Kashmir. Here we present a review on, medicinal plant diversity, plant parts used and diseases treated in traditional medicine of Kashmir. Finally, we suggest suitable Conservation and management strategies for medicinal plants of Kashmir. The present study is the review of existing information on the medicinal plants of Kashmir. Studies published in journals, books, theses and reports were reviewed. We reviewed a total of 30 publications that provided information about the use of medicinal plant species to treat various ailments. Pertinent literature was searched in different electronic databases (ISI Web of Science, MEDLINE, Science Direct, Scopus, and Google Scholar). We do not claim to have included every existing information source about traditional uses of medicinal plants of Kashmir, but we focus on information easily accessible to researchers. The Kashmir valley often referred to as a ‘Terrestrial Paradise’ is well-known around the globe. One of the main features contributing to the worldwide reputation of Kashmir is the rich biodiversity that adorns its captivating landscape. Being phyto geographically located at the intersection of Holarctic and Paleotropical Floristic Realms and falling within the North-Western Himalaya, the region is endowed with teeming diversity of medicinal plants . The study enlisted 81 medicinal plants used by the people of Kashmir. These plants belonging to 15 families of spermatophytes. The results are presented in (Table 1) (4-43) with family names, taxon name, local name, arts used, and medicinal use. The representative angiosperm families with highest number of plants were Asteraceae (10) Ranunculaceae (5) and Lamiaceae (4) (Table 2). Among gymnosperms most plants belonged to family Pinaceae (4) (Table 2). Table 1. List of plants used as ethanomedicine in Kashmir Valley. Table 2. Families with the largest number of medicinal plants [more than 2 species] in Kashmir valley, India. The most commonly used plants were Taraxacum officinale, Artemesia absenthium, Malva sylvestris, Berginia ciliate, Rheum emodi, Vitis vinifera and Cedrus deodara. Dicots were dominant (89%) with followed by gymnosperms (7%) and monocots (4%). Among these plants 50 were endangered, 37 scattered and 13 were doutfull. Most of these plants were herbs (75%), most likely because they are more abundant (Figure 1). The more abundant a plant is, the more likely it is to be used. The next dominant growth habit of was tress (15%), followed by shrubs (8%) and climbers (2%). Figure 1. Percentage of different taxa of Spermatophytes reviewed in present study. A total of 12 major ailment categories were treated with medicinal plants (Figure 2). The main ailment catagories that are treated include dermatological, gastrointestinal, skeleto-muscular, cough and cold, respiratory, dental, wounds, genito-urinary, Fever, headache, circulatory and opthamological. A single plant species may be used to cure several human ailments. Some of the remedies were prepared by combining different plants. Figure 2. 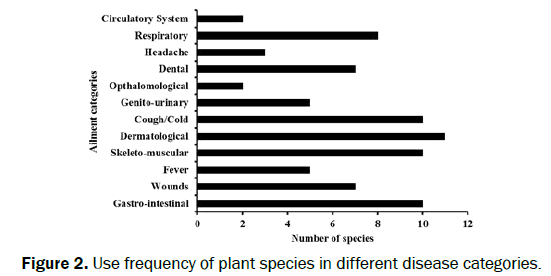 Use frequency of plant species in different disease categories. For the treatment of ulcers, the powdered rhizome of Dioscorea deltoidea is mixed with powdered root of Berberis lycium . Complex medicines of two or more plant species are thought to be more potent than those prepared with single species which may be attributed to interactive effects of the plants. In many cases two or more diseases are treated using one plant like Lavetera kashmeriana is used for the treatment of mumps and skin irritation in pregnant women . Medicines used were prepared mainly by boiling to make pounding to paste, soaking in water to make infusions, decoctions, squeezing, burning to ash, grinding, to powder, chewing, and baking under hot ashes. The traditional hakims and healers utilize different parts of the plants as remedy for different ailments. However, the use of a particular plant part depends on the plant habit and user’s needs. The most frequently used plant parts in the preparation of herbal remedies include leaves , fruit, roots, rhizomes , whole plants , Seeds , flowers and bark (Figure 3). The use of specific plant parts suggests that these parts may be associated with strong medicinal properties and exhaustive phytochemical screening is required tom validate the ethanomedicinal claims scientifically. Our findings of the frequent use of green leaves and in the preparation of remedies corroborate the results of [11-13]. Different liquids such as water, juices, sugar, tea, honey, edible oil, and milk are mixed with plants or plant parts during the preparation of the remedies. The prepared remedies are mostly administered orally (63%), less frequently dermally (19%) or both orally and dermally (15%). Only 3% is administered through ears or eyes. Figure 3. Status of plant parts used. Defence Institute of High Altitude Research, Leh and Shree Mata Vaishno Devi University, University of Jammu, Jammu are keenly involved in developing conservation technologies for medicinal plants of the state. The In-situ conservation of biological resources has been attempted all over India both by the central and state governments. Presently, there are 4 National Parks and 15 Wildlife Sanctuaries for the in-situ conservation of biological diversity [1,4,10,27,40]. Besides this one Biosphere reserve has also been proposed recently. These areas cover different altitudinal zones ranging from tropical to alpine and are helping largely in the in-situ conservation of threatened and economically important medicinal plants of the state. However, fragmentary information is available on the diversity, geographical distribution, utilization pattern, and folklore information of threatened medicinal plants in the state. Thus, there is a pressing need to identify the areas (protected and unprotected) and report rich areas as Economically Important Plant Conservation Zones (EIPAZs) at different altitudes with the involvement of the native populations and the various other organizations (State, Central and NGOs). There is also an urgent need for the development of conservation repositories like herbal gardens, nurseries and encouraging farmers to cultivate threatened medicinal plants of the state. Although there are many Governmental and non-Governmental organizations putting their efforts for the conservation of these important plants, there are many other commercially important plants whose conservation technologies are yet to be standardized. Development of Conservation technologies for these plants will not only help in stimulating mass cultivation in fields but also, aid in reducing pressure on wild stock. Singh JS. The biodiversity crisis A multifaceted review. Curr Sci. 2002;82(6):638.
WHO World Health Organization. Traditional Medicine Strategy. 2002; PP: 11.
WHO. Traditional Medicine. Fact sheet. 2002;134. Malik AR et al. Ethnomedicinal Practices and Conservation Status of Medicinal Plants of North Kashmir Himalayas. Research Journal of Medicinal Plant. 2011;1-15. Joshi K, Chavan P and Warude D. Molecular markers in herbal drug technology. Current Science. 2009;87:159- 165. Pandey MM, Rastogi S and Rawat AK. Indian herbal drug for general health care- An over view. The Internet Journal of Alternative Medicine. 2008;6(1):1-10. Dar GH., Khuroo, and A.A. Floristic Diversity in the Kashmir Himalaya Progress Problems and Prospects SainsMalaysian . 2013;42(10):1377–1386. Akhtar N. Diversity and use of ethno-medicinal plants in the region of Swat North Pakistan. Journal ofEthnobiology and Ethnomedicine. 2013;9;25. Baba Shoib A and Shahid A Malik. Determination of total phenolic and flavonoid content antimicrobial and antioxidant activity of a root extract of ArisaemajacquemontiiBlume. Journal of Taibah University for Science. 2014;9:449–454. Humeera N. Antimicrobial and antioxidant activities of alcoholic extracts of Rumexdentatus L. Microbial pathogenesis. 2013;57:17-20. YousufM. In vitro antibacterial activity and phytochemical studies of methanolic extract of leaves of Hypericumperforatum L. growing wild in Kashmir Himalaya Asian. Journal of Plant Science and Research. 2012;2(4):414-420. Samant SS. Medicinal Plants in Himachal Pradesh north western Himalaya India. International Journal of Biodiversity Science and management. 2007;3:234- 251. Kala CP. Medicinal Plants of the high altitude cold desert in India diversity distribution and traditional uses. International Journal of Biodiversity Science and Management. 2006b;2:43–56. Mir MY. Ethno medicinal survey of plants from Kupwaraj & k India. International Journal of Traditional and Herbal Medicine. 2013;1:181-189. Baig BA, Ramamoorthy D and BhatTA . Threatened medicinal plants of MenwarsarPahalgam Kashmir Himalayas Distribution pattern and current conservation status. Proceedings of the International Academy of Ecology and Environmental Sciences. 2013;3:25-35. Khan JA and Kumar S. Ethno medicinal uses of some medicinal plants used for snake bite in Poonch District of Jammu and Kashmir India. Life science leaflets. 2012;10:123-32. Kumar M, Paul Y and Anand VK. An ethnobotanical study of medicinal plants used by the locals in Kishtwar Jammu and Kashmir India. Ethnobotanical Leaflets. 2009;2009(10):5. Samant S S and U. Dhar. Diversity endemism and economic potential of wild edible plants of Indian Himalaya. The International Journal of Sustainable Development & World Ecology. 1997;4(3):179-191. Bhattacharyya A. Ethnobotanical observations in the Ladakh region of northern Jammu and Kashmir State India. Economic Botany. 1991;45(3):305-8. Siddiqui BS. Evaluation of Viburnum grandiflorum for its in-vitro pharmacological screening. African Journal of Pharmacy and Pharmacology. 2012;6(22):1606-10. Kapahi BK, Srivastava TN and Sarin YK. Traditional medicinal plants of gurez Kashmir–an ethnobotanical study. Ancient science of life. 1993;13(1-2):119. Khan ZS, Khuroo AA and Dar GH. Ethnomedicinal survey of Uri Kashmir Himalaya. Indian Journal of Traditional Knowledge. 2004;3(4):351-7. Ballabh B. Traditional medicinal plants of cold desert Ladakh—used against kidney and urinary disorders. Journal of ethnopharmacology. 2008;118(2):331-9. Sharma PK and Singh V. Ethnobotanical studies in NorthWest AND Trans-Himalaya. V Ethno-veterinary medicinal plants used in Jammu and Kashmir India. Journal of ethnopharmacology. 1989;27(1):63-70. Ballabh B and Chaurasia OP. Traditional medicinal plants of cold desert Ladakh—used in treatment of cold cough and fever. Journal of ethnopharmacology. 2007;112(2):341-9. Koul M K. Medicinal plants of Kashmir and Ladakh and cold Arid Himalaya Indus Publishing Company New Delhi. Mahmood T and Shah A.Medicinal plants used by traditional healers of poonch district. Lifescience leaflets. 2012;5:53-60. Srivastava TN et al. An index of the available medicinal plants used in Indian system of Medicine from Jammu and Kashmir State. Ancient science of life. 1986;6(1):49. Nawchoo IA, Buth GM and Sahni KC. Studies on the medicinal plants used by the Gujar and Bakarwal tribes of Jammu and Kashmir. Advances in plant sciences research. 1994;1:191-203. Mala FA et al. Ethno-medicinal survey of Kajinaag range of Kashmir Himalaya India. International Journal of Pharmacy and Biological Sciences. 2012;3:B442-9. Shah A et al. New ethnomedicinal claims from Gujjar and Bakerwals tribes of Rajouri and Poonchdistricts of Jammu and Kashmir India. Journal of ethnopharmacology. 2015;166:119-28. Kirn HS, Kapahi BK and Srivastava TN. Taxo-ethnobotanical observations on the gymnosperms of Poonch district J. &. K state India. Journal of Economic and Taxonomic Botany. 1999;23(1):155-60. Bhardwaj AK et al. Ethnoveterinary medicinal uses of Plants of district Bandipora of Jammu and Kashmir India. Int J Trad Nat Med. 2013;2(3):164-78. Lone PA and Bhardwaj AK. Ethnomedicinal uses of certain locally available plants of Bandipora district of Jammu & Kashmir India. International Journal of Medicinal and Aromatic Plants. 2013;3(4):470-85. Mir AH. Pharmacological and phytochemical properties of Iris kashmiriana baker as a potential medicinal plant of Kashmir Himalaya. Global Journal of Research on Medicinal Plants & Indigenous Medicine. 2014;3(12):460. Dutt HC, Bhagat N and Pandita S. Oral traditional knowledge on medicinal plants in jeopardy among Gaddi shepherds in hills of northwestern Himalaya J&K India. Journal of ethnopharmacology. 2015;168:337-48. Tariq A, Mussarat S and Adnan M. Review on ethnomedicinalphytochemical and pharmacological evidence of Himalayan anticancer plants. Journal of ethnopharmacology. 2015;164:96-119.